To ensure your extensions last a long time, find the right type of extensions to fit your lifestyle. You want to find the type of extension and application that will work well with your hair and scalp. Shop around and take advantage of free consultations so you can explore and ask questions about the different types of extensions available on the market. “If you want to use extensions, you should have your extensions applied by a licensed professional,” says Philadelphia stylist and salon owner Giovanni Melé of Giovanni & Pileggi. “Find a brand that is made from the highest quality of human hair, and use a Keratin bond that creates a strong hold with the least amount of damage. A person has to decide when to take this type out, rather than other extensions that use synthetic bonds. 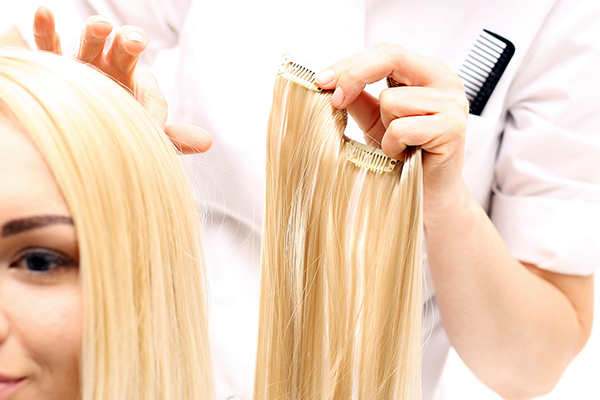 Synthetic bonds deteriorate with washing, humidity, and over using hair tools which cause the extensions to fall out. Some higher end brands can be pricey depending on how many bundles of hair a person would like to put in but last from four to six months. A great paddle brush with boar bristles is crucial for fine hair. For high-quality hair extension products check out Jadore Hair Extensions online. Before taking a shower, use a detangler, and then proceed to slowly brush, starting at the ends and working your way through the root to prevent breakage. Ensure that you brush the attachment area as well as the lengths of your extensions to prevent tangling at the roots. Once extensions get tangled, things get messy quickly! Be diligent about follow-up appointments your stylist makes for you, especially if you are a first-time extension client. Your stylist should schedule a complimentary check-up for one to two weeks after first-time application. This is for a review of your home-care maintenance. Very often potential problems can be averted if you stay on top of them. When possible have your colour done at the same salon where you get your extensions. Not every hair professional is familiar with hair extensions and an incorrect blow dry, or shampoo can create a disaster! “My clients swear by using silk satin bed sheets to help prolong the life of their extensions. They also wear their hair up in a loose ponytail to minimise matting and tangling of their extensions,” says New York celebrity hair stylist Angelo David, who also cautions to never go to sleep with wet hair! Exposure to hot hair tools like straighteners and curlers can cause damage to your extensions. Don’t use a flat or curling iron near the base of your extensions, or ever aggressively brush hair without holding hair by the base.